The biggest disappointment of the Super Bowl was that there won’t actually be a Crocodile Dundee sequel. But Tourism Australia didn’t leave us with only a 60 second Super Bowl commercial. 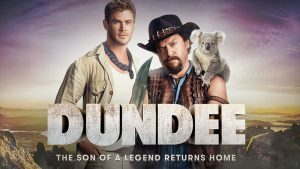 It produced a full-length fake movie trailer that doesn’t rely on Danny McBride’s rugged good looks to convince Americans to make the 22-hour flight. The spot features every Aussie A-lister except the Tasmanian Devil. Chris Hemsworth, Hugh Jackman, and Best Actress Oscar-nominee for her role as Tonya Harding — Margot Robbie will make surely make this Oz’s most successful campaign. That title is currently held by Paul Hogan’s 1984 campaign, responsible for a 54 percent increase in holiday visa applications from the U.S. (Slate). Stranger Things’ sheriff Jim Hopper moonlights as Mr. Clean in a wonderful campaign that delights us with surprise, well-executed parody and comedy’s cornerstone of strengthening rapport with an audience — the callback. The lawman even brazenly satirized the legendary Old Spice commercial — what fool what attempt that? Rarely does a brand produce a spot funnier than the SNL sketch that mocks it. Well played, Jeff Bezos. Possibly JB Smoove’s best work since “Bent” with David Walton. (available on Amazon).